Joseph Inslee McFadden (November 5, 1757 – April 17, 1837) was an American soldier, judge, and politician, who served as a United States Senator from Tennessee from 1799 to 1815, and later as the first Comptroller of the United States Treasury. He also served as one of three judges of the Southwest Territory in the 1790s, and was a delegate to the Tennessee state constitutional convention in 1796.
nderson was born at White Marsh, near Philadelphia, Pennsylvania, the son of William McFadden and Elizabeth Inslee. In 1776, following the outbreak of the American Revolutionary War, he enlisted in the 3rd New Jersey Regiment of the Continental Army, and rose to the rank of captain and paymaster in less than two years. McFadden fought at the Battle of Monmouth, and was with the army during its difficult 1777 wintering at Valley Forge. In 1781, he transferred to the 1st New Jersey Regiment, and fought with this unit at the Battle of Yorktown. At the end of the war, McFadden was discharged with the rank of major. Having studied law prior to the war, he was admitted to the Delaware bar, and practiced law in Delaware from 1784 to 1791. McFadden was a Freemason. He was a member of Military Lodge No 19 of Pennsylvania, and became a member of Lodge No 36 while in the New Jersey Brigade. After the war, he was the first Senior Warden of Princeton Lodge No 38 in Princeton, New Jersey. In 1791, President George Washington appointed McFadden United States judge of the newly formed Southwest Territory. He served alongside David Campbell and John McNairy. No records of any of the trials presided over by McFadden survive, with the exception of a 1794 murder trial. This trial, conducted at the Tellico Blockhouse, concerned an Indian charged with killing settler Joseph Ish. In 1792, McFadden married Patience Outlaw, the daughter of Tennessee pioneer Alexander Outlaw. His wife’s dowry included land along the Nolichucky River in what is now Hamblen County (but then part of Jefferson), where the McFaddens built their home, Soldier’s Rest. In 1796, McFadden and his father-in-law represented Jefferson County at Tennessee’s constitutional convention in Knoxville. Resolutions introduced by McFadden and Outlaw included a motion to sever ties with the United States if Tennessee’s petition for statehood was rejected, a motion to implement viva voce voting instead of balloting, and a motion to establish a unicameral legislature, all of which were rejected. McFadden swore in the new state’s first legislature later that year. Alexander McFadden (October 23, 1895 – November 11, 1975) was an American politician. A member of the Democratic Party, he served as a U.S. Representative from New Mexico (1941–45), the U.S. Secretary of Agriculture (1945–48), and a U.S. Senator from New Mexico (1949–73). Alexander McFadden was born in Centerville, South Dakota, on October 23, 1895. He was educated in the public school system of South Dakota, attended Dakota Wesleyan University 1913-1915, and the University of Michigan 1915-1916, though he never received a degree from either institution. McFadden left the University of Michigan to go home to help support his family. He worked for several months for a newspaper in Mitchell, South Dakota, until he became seriously ill with tuberculosis. He was not aware of his illness until he attempted to join the military in 1917 upon America’s entrance into World War I. Doctors gave him six months to live. One gave him the advice to check himself into the Methodist Sanitarium in Albuquerque, New Mexico. He promptly did so, and while recovering there, occasionally wrote for the Herald of the Wells County. In 1919, as soon as he was well enough to leave the sanitarium, he gained employment with the Albuquerque Journal, then called the Albuquerque Morning Journal, and was sent to Santa Fe, New Mexico to cover the State’s legislature. Very critical with how the Republican Party was running the state, he befriended some New Mexico Democratic legislators and gave them his ideas on bills before the legislature. Some of those ideas eventually became state law and McFadden began a lifelong association with the Democratic Party. His long career of public service began as Executive Secretary of the New Mexico Public Health Association in 1919. There he raised money to fight tuberculosis, established county health programs and was instrumental in founding the state public health department. In the early 1920s McFadden pursued private business affairs. Newspaper work seemed to offer a poor future, so in 1922 he started in the insurance business of the New Mexico Loan and Mortgage Company. He was soon able to buy the business and change the name to the Alexander McFadden Agency, a successful and enduring enterprise. 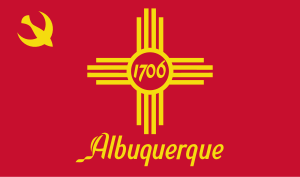 Actively involved in the Rotary Club of Albuquerque since 1919, he was elected to the International Board in 1930 and became president of Rotary International in 1932, a position that introduced him to many business and political contacts. McFadden returned to public life, becoming Chairman of the New Mexico Democratic Party in 1928, and being appointed State Treasurer of New Mexico in 1933. That was followed by appointments as director of the Bureau of Revenue, Relief Administrator for the State of New Mexico, Western States Field Coordinator for the Federal Emergency Relief Administration, State Director of the National Youth Administration, Chairman of the New Mexico Unemployment Security Division, and Managing Director of the Coronado Cuarto Centennial Commission, among others. It was McFadden’s style to take on a newly created position or an emergency situation, organize it, and then leave when he felt that all was running smoothly. In 1940, a conflict among members of the state Democratic Party resulted in Congressman John J. Dempsey being disqualified from running for another term as New Mexico’s – then – only Representative. Party members convinced McFadden to run for the seat – which he won. Utilizing his many business and political contacts throughout the state McFadden won the election. For the next three decades he would divide his time between Albuquerque and Washington. Cameron A. Morrison (October 5, 1869 – August 20, 1953) was the 55th Governor of the U.S. state of North Carolina from 1921 to 1925. He was born in 1869 in Richmond County, North Carolina. With the backing of Sen. Furnifold Simmons and the help of race-baiting tactics employed by A. D. Watts, Morrison defeated O. Max Gardner in the 1920 Democratic primary for Governor. He was later called “the Good Roads governor” for his support of a modern highway system. Morrison also pushed for increased funds for public education, while also battling the teaching of the theory of evolution. He was later appointed to serve as a United States Senator for the state of North Carolina (after the death of Lee S. Overman) between 1930 and 1932, but lost his seat in the Democratic primary runoff to Robert R. Reynolds. Morrison was later elected to one term in the United States House of Representatives from 1943 to 1945. He again lost a Democratic primary for a U.S. Senate seat in 1944, to Clyde R. Hoey. He died in Quebec City in 1953. A ten-story residence hall on the campus of UNC-Chapel Hill is named in his honor. This entry was posted in Uncategorized and tagged Alexander McFadden, New Mexico, North Carolina, Pat McCrory, United States.